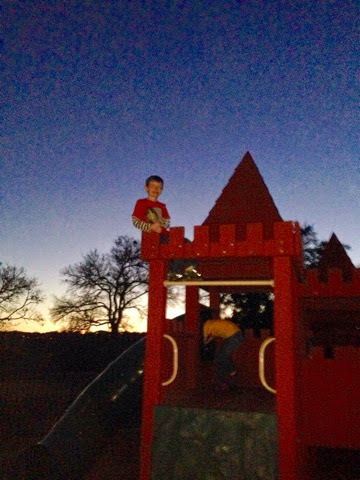 Hudson's Adventures: Adventure boy climbs again! Why play in the play structure when you can climb on top? This is the sight I saw when I came outside at Fuddruckers to tell Hudson that it was time to go soon. He wanted to climb up to the "point," but I said no. He told me that he could see "the stars and stuff" much better from up there. He actually sat up there watching the stars appear for quite some time.